New Delhi: China’s growing influence in the Maldives can now be seen to be believed. 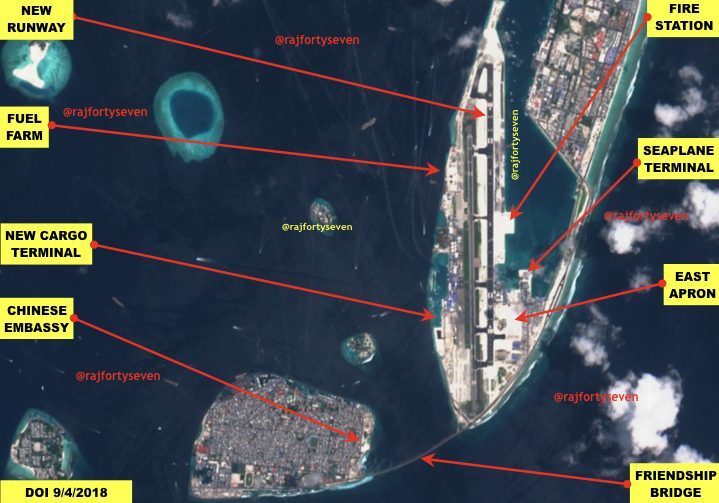 The growth of Chinese influence in the archipelago republic, located only 130 km south of India’s Lakshadweep Islands, manifests itself in the expansion of the Chinese embassy and the Malé international airport, among other landmarks, shows satellite imagery studied by The Print. India has had a close relationship with the Maldives through the ages. In November 1988, a military intervention by India saved the then Maldivian President Maumoon Abdul Gayoom from a coup d’état by Sri Lankan terrorists who had entered the army headquarters near the presidential residence. Op Cactus landed the Indian Army’s 6 Parachute Regiment at Malé airport (without maps) within hours of an SOS call from the Maldives. Normalcy was restored in the capital city within days with minimum casualties. The India-Maldives relations became stronger, and people-to-people contact and trade increased. Yet today, three decades later, India’s relationship with the Maldives is far worse than with a similarly disposed Sri Lanka. The latest sign of the tumble is the archipelago’s rejection of two Indian helicopters that have been stationed there for search and rescue. The slide, however, began after 12 February, 2012, when President Mohamed Nasheed was picked up by the Maldivian National Defence Forces (MNDF) and coerced to resign by the then defence minister Col Mohamed Nazeem (Retd). Relations further deteriorated in November 2012, after Indian firm GMR’s contract for the expansion of the Malé airport was scrapped and the company told to leave within a week by Nasheed’s successor Mohammed Waheed Hassan. The lowest ebb came when Nasheed sought refuge with the Indian embassy in February 2013, and the Maldives sternly asked the Indian ambassador not to interfere in its internal affairs. Abdulla Yameen took over the reins after an allegedly unfair election in 2014. After a few months, he began a purge of all his opponents, including his own party members. Anybody who opposed him was put behind bars on terrorism charges, including Nasheed, his own half-brother Gayoom, the vice-president, the defence minister, and the chief justice of the supreme court. The list is unending. The Chinese embassy was established at Malé in 2011. Since then, Beijing’s influence in the internal affairs of this island nation has increased, at the cost of India’s. Tourism to the Maldives has been greatly subsidised for Chinese citizens, making Malé the most favoured destination for tourists from the country. Chinese restaurants in the Maldives, especially those in Malé and Hulhumalé, a reclaimed island off the capital, have been rude to Indian customers, according to accounts of visitors. The waiters are known to snoop on conversations. 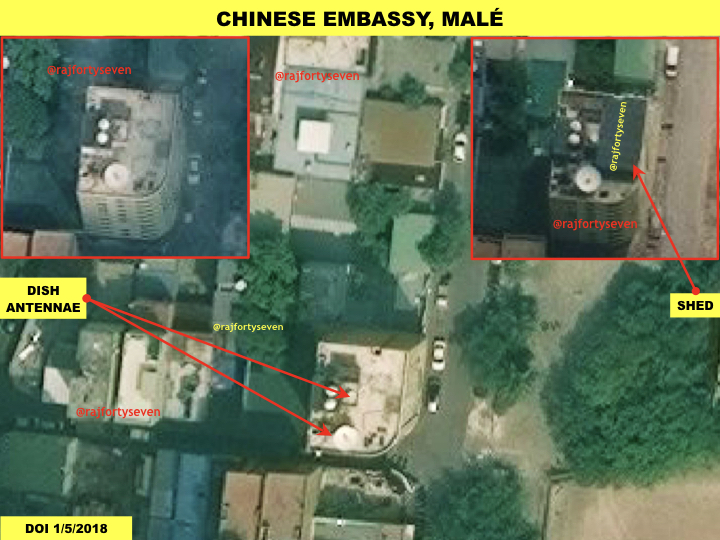 Satellite images of the Chinese embassy, one of the tallest buildings in Malé, show vividly the large dish antennae and other snooping equipment on its terrace. Most of the equipment has now been hidden under a semi-permanent shed that covers most of the terrace. Within 90 days of the Chinese embassy’s establishment, Nasheed was ousted in a coup and the relatively unknown Mohammed Waheed Hassan took over. 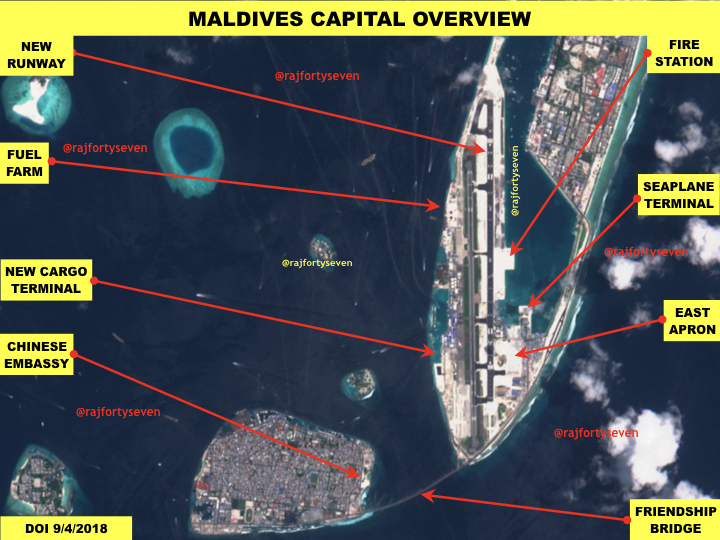 With the Maldives occupying an ever more prominent space on tourist itineraries, the authorities felt the Malé International Airport needed to be expanded. In 2010, GMIAL GMR International Airport Ltd entered into a concession agreement with the Maldives government and Maldives Airport Company (MACL) to modernise and operate the airport, then known as Ibrahim Nasir International Airport. But within a year of the Chinese embassy’s establishment in Malé, the concession agreement was wrongfully repudiated both by the Maldives government and MACL. The Maldivian government secured a loan of $373 million from China’s EXIM Bank. The preferential buyer credit loan agreement signed in 2015 was used to settle the arbitration costs and for the expansion of the airport. 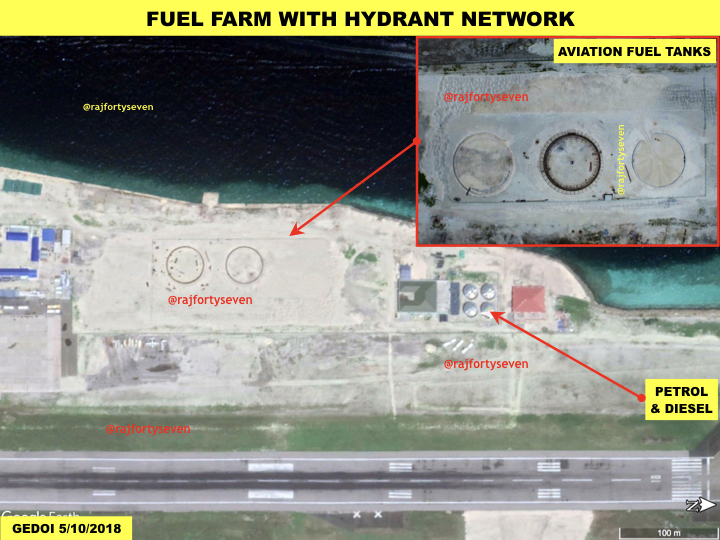 Second runway: Satellite images from 4 September suggest that the second runway of the airport is now complete and ready for flights. With a length of 3,600 m and width of 60 m, the runway was supposed to be completed before 31 August, 2018. Fuel farm: The new fuel park has three large fuel tanks (15,000 cubic metres each) connected to a fuel hydrant network system. The farm will also have two sets of petrol and diesel tanks with a capacity of 500 cubic metres each. This will increase the fuel-holding capacity of the airport threefold. East Apron: The concrete work for the construction of a six-hectare apron — the area where aircraft are parked — seems to be complete. The support buildings are expected to be completed by March next year. Cargo terminal: The new cargo terminal basement is being prepared and the demolition of the present passenger terminal pier has begun. 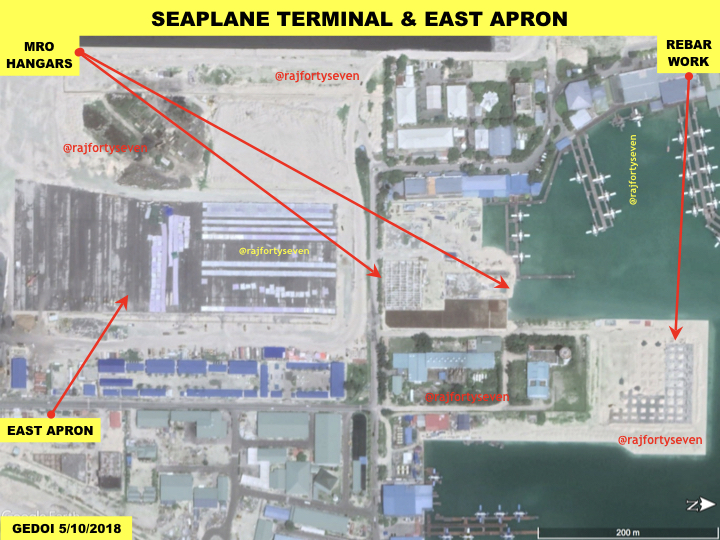 Seaplane terminal: The new seaplane terminal is expected to have approximately 100 parking slots. The ground work for the main terminal building is complete. The MRO (maintenance, repair and overhaul), line maintenance and heavy maintenance hangars are under construction. The new terminal will have two water aerodromes, possibly one each for landing and takeoff. Water aerodromes are bodies of open water meant for amphibian aircraft. The idea of a bridge between the two islands of Malé and Hulhulé was mooted by the Indian company entrusted with the expansion of the airport. 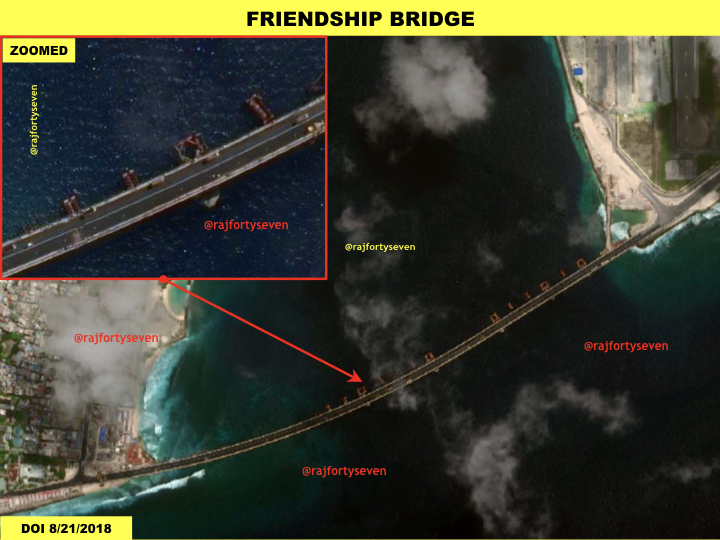 But somehow, as the diplomatic wrangling between India and the Maldives lost the Indian firm the expansion project for the airport, the construction of the bridge went to the Chinese too. The bridge, the first cross-sea one for the Maldives, was opened to the public on 31 August. The length of the structure, named the ‘Sinamalé Bridge’, is 1.4 km and the width 21.5m. The bridge has two lanes for large vehicles and two small ones for motorcycles. It also has a separate pedestrian walkway. The Maldivians brush off Indian suspicions. When Indians point out that Sri Lanka had to lease a port (Hambantota) built by the Chinese to the country over debt struggles, the Maldivians say territorial integrity is sacred to them as well as the Chinese. However, the Maldives does not officially refute claims that it is allegedly leasing particular islands. The name of the ‘friendship bridge’, Sinamalé, also speaks volumes about the dragon’s grip over the island nation. High-ranking Chinese diplomats in Malé are effectively influencing and controlling the political situation through economic pressures. China is emboldened by the world’s reaction to its debt-trap diplomacy, and aggressively pursuing it all over the world, especially in the Indian Ocean Region.